As much as I miss summer’s warm weather, I do love this time of year. The leaves are changing and look like they’re positively glowing when the sun hits them just right, it’s acceptable for me to break out my knee socks again, plus I can curl up with a good book or an episode of Mad Men (*swoon*) without feeling guilty about not playing beach volleyball or ultimate frisbee or whatever it is the beautiful people are doing. I love living in Vancouver, but it does make me feel like I’m living in a brochure for Active! Living!! some days. You’re still in bed at 10 a.m. on a Saturday? Jeez! I’ve already hiked Grouse Grind and cooked a week’s worth of dinners with the organic veggies I picked up at the farmer’s market. Haha! Off to an open house! For those of us who prefer receiving candy with our cardio, Halloween is just around the corner. And just after that is the Day of the Dead, a slightly darker, but truly beautiful holiday that I’m glad to see more North American people adopting. In Mexico, families will traditionally gather on November 1st to pray for and remember friends and family members who have died. But unlike funerals, they’re celebrations. Lots of food, parades, festivals – they celebrate the people they loved. The Gem Gallery here in Vancouver has invited me to particpate in their Dia de los Muertos gallery show running from October 16th to November 2nd. I still have a lot of work to do, but the painting for the show is coming along. 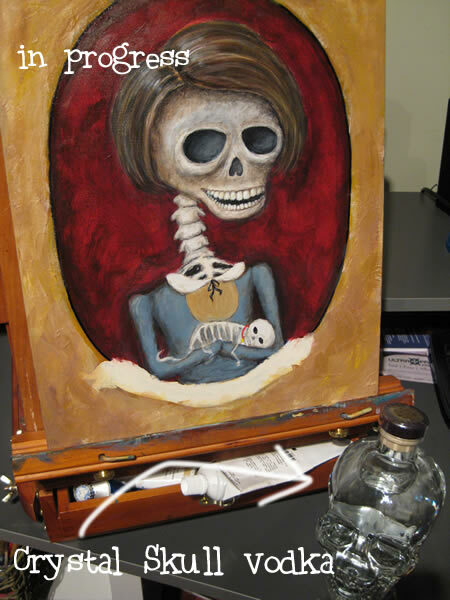 And since my mister is oh so helpful, he bought some Crystal Head Vodka so I could use it as a model. That’s what he tells me anyway! 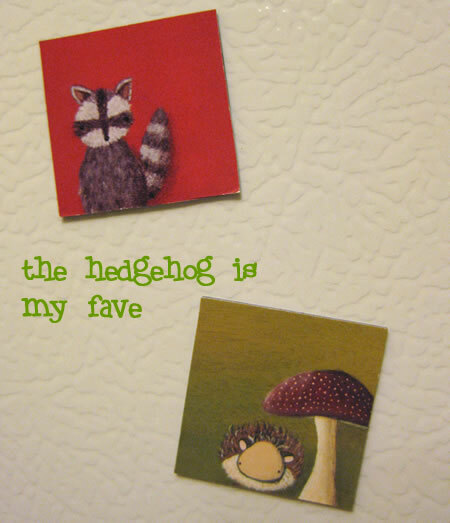 While I’m pimping my new gallery show, I may as well use my new super cute magnets to do the job, no? 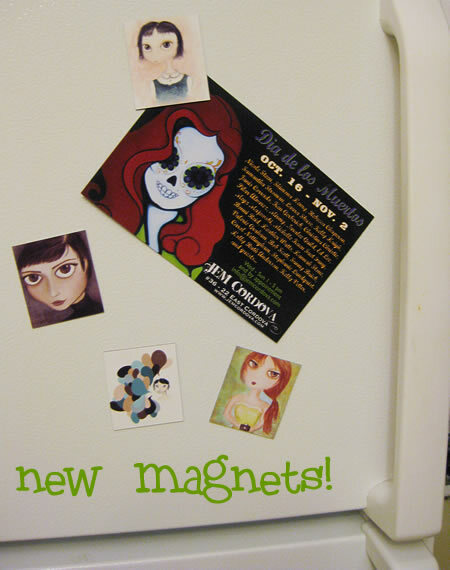 For the month of October, all orders in the shop get a free magnet tucked into their package. I really love the teeny tiny critters. So cute! Oh i adore your work in progress…looking so cool. 🙂 Have a lovely merry happy day and love to you!